The surveillance camera market is quickly growing. Cameras are everywhere these days, making us safer. 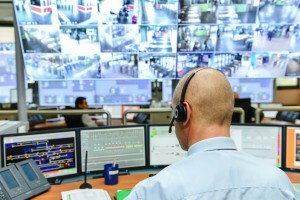 The surveillance market is characterized by having a wide range of application-specific solutions that are each adapted for a particular purpose. Due to our flexibility of combining video content analysis with video coding, and being able to optimize the video processing for different use cases, the videantis platform IP provides an ideal basis for building such solutions. The upgradeability of the videantis platform IP further enables to benefit from ongoing advances in image analysis technology even in existing installations just by applying firmware updates in the field. Surveillance solutions enabled by videantis IP include region-of-interest based video compression, which transmits important parts of the image like faces or people at higher quality, and non-important parts of the image at lower quality. This way the available bandwidth or storage capacity is used in an optimal way. When operating a pan-tilt-zoom camera, low-delay is key, otherwise it will be hard to control the device. The operator will overshoot and become quickly frustrated when video transmission delay is high. Videantis has optimized its video coding solutions for low delay operation, without impacting the quality of the captured video. Surveillance are quickly becoming smarter. Being able to detect, follow, and count people for instance is a key requirement. For traffic control solutions, it’s important to recognize objects like cars, trucks, trains, people on the road or tracks, and license plates. The high-performance computer vision capabilities enable a wide variety of surveillance applications.